In these sincere, honest expressions of pain, there are also expressions of people whose hate of Islam and Muslims is so consuming that for them, there is no other reality except that Islam and Muslims are the single greatest threat to the so-called “Judeo-Christian Civilisation”. These hate-filled people contaminate the lives of everyone around them, with their venom and with their regurgitated fantasies against Islam and Muslims; fantasies that are false and un-verified, but their constant repitition has transformed them into unchallenged facts. The hate-filled fantasies against Islam and Muslims, include the “oppression” of women by forcing them to wear Burqas, Female Genital Mutilation, Honor-Murders and of course, “Muzlems” celebrated 9-11 all over the world. All these have just enough truth behind them to make them credible to all those who do not take the time to check the real facts for themselves. Yes, society-forced Burqas, Female Genital Mutilation, Honor-Murders have been found among Muslims, but Burqas are no more “forced” on women, then are high heels and short skirts (especially in Winter!) are forced on women in the “Judeo-Christian Civilisation”. FGM and Honor-Murders are pracxtised among MANY non-Muslim cummunities, in fact, FGM is most often found among non-Muslims of Africa and hardly found elsewhere. As for Muslims celebrating 9-11. I recall a journalist recently published a book in which he said he was in Mexico during the 9-11 period and people in bars would shout their support when they saw pictures of the Twin Towers coming down. No, they aree not “Muzlems“. 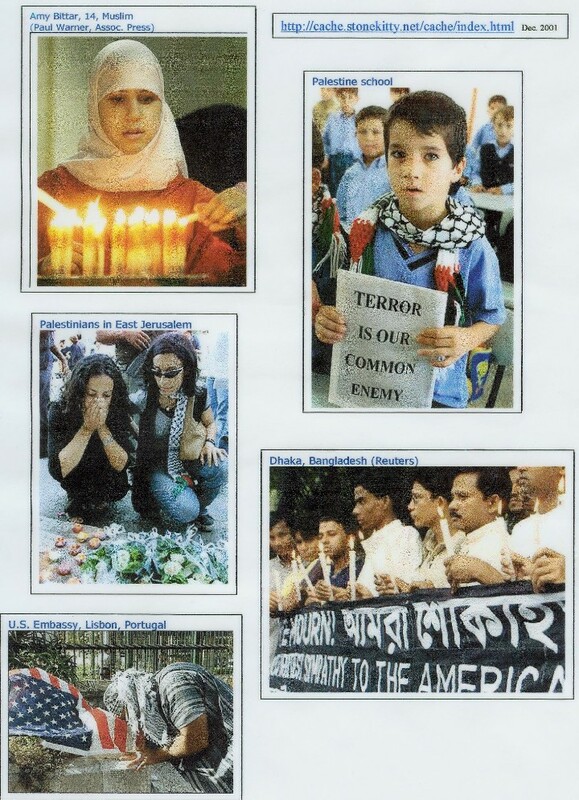 The FACT is that Muslims joined others around the world in their mourning of the 9-11 tragedy, there were even massive, spontanoues marches in support of the victims and against terroism, in many Muslim-majority countries. Check out the pictures below. I copied them off the web about ten years ago when I did not know much about computers so, I copied them on a Word document! Now I cannot find the original website because I am still not computer-savvy enough. If anyone can find the original website, and let me know, I shall be most grateful. I assume your comments are directed as a condemnation, at the perpetrators of the 9-11 tragedy. I think alternative web site proprietors need to consider this blog as an unit, incredibly clean and great user-friendly layout, not to mention the content. You’re an qualified within this matter! All I need to know about Islam, I learned watching the attacks of 9/11/01. Well Chaz, that is a comment that has been making its rounds (word for word) for a long time and I must say, it is a particularly brainless statement. How would it sound if someone said, “All I need to know about Christianity, I learnt from Nazis/Whit S. Africans/KKK/Serbs? How about, “All I need to know about Jews, I learn from Settlers and Baruch Goldstein”? Before you condemn and entire group pf people, consider where your biases are coming from, who is feeding them and whether you actually understand anything at all, about that group…not as fed to you by another bigot. One of the best books written about Islam, by a non-Muslim, is, “An Introduction to Islam for Jews” by Rabbi Reuven Firestone. You should read it.